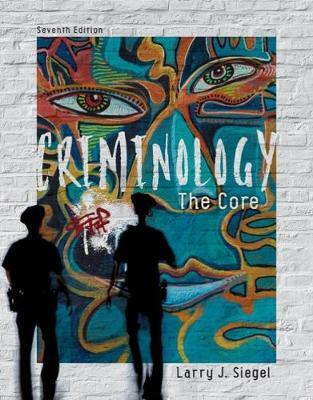 Concise, current and affordable, CRIMINOLOGY: THE CORE, 7th Edition, delivers cutting-edge coverage in an easy-reading paperback. Author Larry Siegel guides you through the fast-paced field of Criminology, its most current research and fascinating examples that help you understand criminological theory. Details on the crimes of real-life people illustrate concepts, and unbiased coverage of even the most controversial issues enables you to form your own opinions. You'll get the latest insights into political crime; terrorism (e.g. ISIS); white-collar, blue-collar and green-collar crime; cybercrime; transnational crime (e.g. human trafficking) and many other topics. And features such as 'Thinking Like a Criminologist' role plays and 'Connections' to the big picture help you do your best in the course.